Putting to shame the endless parade of warnings issued elsewhere in the world, Chinese authorities have made another 119 OneCoin related arrests. Public court documents have also detailed the recovery of a large sum of money stolen from OneCoin victims, including $7.2 million stashed in a bank account belonging to Sebastian Greenwood. Authorities in China’s Hunan province began investigating back in 2016. Yesterday authorities in Hunan released information pertaining to another one hundred and nineteen arrests. Since their arrest, each of the arrested suspects have confessed to participation in OneCoin as an investor. Two of the arrested suspects have already been sentenced to more than five years in prison. Authorities claim the OneCoin bust is the “largest MLM case” ever investigated in Hunan. The case spanned twenty Chinese provinces, Hong Kong and “overseas countries”. 20,000 bank accounts belonging to suspects were analyzed, along with “tens of millions” of transactions. Some 200 shell companies related to OneCoin were also part of the investigation. Investor losses meanwhile have now been pegged at $2.4 billion – a staggering amount considering the continued inaction of authorities outside of China. In related news a lengthy judgment from the Zhuzhou Intermediate People’s Court in Hunan has also surfaced. The judgment is dated December 17th, 2017 and certifies OneCoin is an illegal pyramid scheme. Of note is a list of frozen assets at the end of the filing, including names and bank accounts. Whereas most of the OneCoin investors are Chinese, there are some in English. Most notably Sebastian Greenwood, who authorities managed to recover 45.5 million yuan from ($7.14 million USD). Like OneCoin Founder Ruja Ignatova, Sebastian Greenwood went into hiding in 2017. Before Kari Wahlroos was brought on board, Greenwood was primarily responsible for promotion of OneCoin globally. After Wahlroos took over in 2015, Greenwood gained considerable weight and only put in appearances at annual events. Like Ignatova, the total amount Greenwood pocketed from OneCoin investors is unclear. In addition to money, the court document also lists laptops, computers and cars as seized assets. The current whereabouts of Sebastian Greenwood, Robert Archibald and Robert Rysart are unknown. Still think Ignatova is on “maternity leave”? Lulz. The latest excuse for Ruja being missing is according to Chief Excuse Officer Krnic, that she got threats. That’s nice. Though I understand, when you scam hundreds of millions of euros from people, the probability goes up pretty fast that someone would actually act on it. Still that doesn’t explain why there’s zero new images or videos of her. I wonder if China will now join the multi-national criminal investigation underway? Since one of the issues was OneCoin being an illegal pyramid scheme, this finding by the Chinese Court could be a factor in proving this charge. But what was really interesting to me was their claim of some 200 shell companies for OneCoin. I knew they had a lot, but around 200, incredible. And the 20,000 bank accounts that were analyzed. And I believe they are only in China, not in the rest of the countries. I had predicted that OneCoin if left unchecked could be over $4 Billion Dollar Ponzi. I don’t think I am going to be that far off when this is all said and done. But OneCoin has nothing to worry about. This is just another Chinese monkey hunt according to Igor. It’s all about rogue IMA’s and has no effect on the OneCoin business model. I guess being ruled an illegal pyramid scheme has nothing to do with OneCoin’s business model. Ken Labine has been very quiet on OneCoin recently. According to Zhuzhou Police, they started this round investigation on March 15th, and got shocked by the huge amounts of money stolen by Onecoin before long，so they requested support from the Ministry of Public Security. Soon 14 police teams was sent to different cities to investigate and make arrests. There’s one interesting thing in this tv clip, the policewoman in charge of data analysis mistook Ruja to be a German citizen. Ignatova has a German passport IIRC. Ruja also attended high school in Germany. Plus, Waltenhoffen Gusswerks GmBH metal casting company was also located in Germany. The fraudulent bankruptcy of the company lead to convictions in German Court on 24 counts of fraud, for which Ignatova and her father plead guilty, receiving a suspended sentence of a year and two months, back in April 2016. Definitely dual citizenship. Possibly also Dubai citizenship. The most “reliable” rumors I’ve heard place her whereabouts in Russia under syndicate protection for now (assuming she’s not at the bottom of the Black Sea). I love this screenshot! Original, no photomontage! That’s the truth, nothing but the truth. Zero OneCoins mined! @Griffin, the link doesn’t work for me, goes to the main page. Is it correct, or any other way I can navigate to it? This news finally resurrected Krnic’s OneCoin “debate” forum from 5 day deep sleep. The OneCoin Chief Excuse Officer is now preparing his new excuses. I think we are finally close to the point where the excuses lose their power even to the most deranged cultists (= those who are victims of their own naivety/stupidity, not the cynical conartists). Sure, you can dismiss or explain away a issue or two, but the total situation is such a sad mess that mental gymanstics required to “keep the dream alive” is becoming untenable. Aren’t some “Onecoin” leaders still touring a few countries and giving presentations? Don’t any of the people attending these presentations have access to so many news items on Onecoin legality problems all over the world? These meetings must attract the most stupid and uninformed people with zero due diligence skills. Jack, According to Konstantin, when he spoke in Malawi just recently he said that they were focusing on Africa. He had just been in South America, where they are doing a big push. Which is odd because OC keeps claiming it is doing business in 196 countries, which Africa and South America would be included in those countries. But this is Konstantin we are talking about. Roll Eyes. Ripping off people in Malawi? “Onecoin” is revolting! I knew as soon as I saw Tom McMurrain promoting OneCoin, that it was a big fat ponzi scheme. What happened to him and CoinMD? He’ll be back in prison soon, that I can tell you. He held a few events at his house last year. Other than a few gullible Nigerians investing though, CoinMD doesn’t seem to have gone anywhere. Meanwhile DealShaker platform has gotten new deals, currently it has almost 14 000 open deals, which is more than ever in the history of the service. – “Picur Ajandek” – 1049 open deals spread over 5 separate accounts with slightly varying names but same web page address. – “Ropa y accesorios para hombre y mujer” – 366 open deals on a single account. – “Jeansconer” – 196 open deals on a single account. – “SAN PHAM NU SKIN” – 194 open deals on a single account. The platform allegedly has 60 000 merchants, yet 12.9% of all open deals have been made by four merchants alone. Not to forget: Ruja protects all scammers on DealShaker, because the imprints below all only appear as graphics, not as text. This prevents the search engines from capturing the data of the providers. China got this all wrong. I know because Igor said so on his blog. He went into this long winded cya of OC/OL (shock, surprise) designed to show that us “haters” do not check out anything and all we are interested in is destroying OC/OL. “So those legit Onelife people are aware that there is some independent group involved in several scams, and they used “one coin” name and fake website with their own misleading and high return promising promotional material to scam people (similar to Italy except in Italy it was done by the actual IMAs). Those Chinese scammers did not even sell real oneacademy gift codes. The amount of money collected by those fraudsters was $45.7 Million, it is a bit too small amount for 1+ million users in China? Correct. So you see it had nothing to do with OC/OL but was just rogue IMA’s acting on their own that were never part of OC/OL. 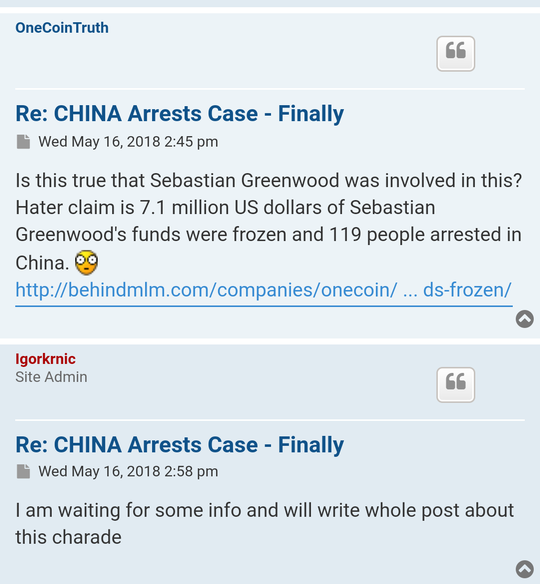 In the meantime 119 OC/OL IMA’s sit in jail, Sebastian Greenwood had over $7 Million Dollars frozen and the Chinese Court ruled that OC/OL was an illegal pyramid scheme. When you construct a narrative based on assertions you make up as you go along, you can come up with anything. The facts don’t need an explanation. Chinese OneCoin investors were arrested for participating in and/or promoting a Ponzi scheme. That’s all there is to it. CryptoKonf Belgrade 2018 is organized by Nikola Korbar and his Onecoin friends. His CryptoTelegraph fake media site full with Onecoin news. He is CEO of Center for Economic Research Belgrade. Its not a real research center but a private company. He is the sole owner and director. Archived page of nodebate forum archive.fo/IFB8r, Krnic showing off some anonymous email sent to CryptoKonf warning them about Principe and Krnic. How does Krnic have access to such email unless Korbar sent it to him? 98 OneCoin MLM investors were prosecuted so far, involved more than 15 billion yuan ($2.4 billion). Some real FUD is spreading on the onecoin debate forum. Apparently all the “Coinsafe” ponzi coins are MIA. Fascinating to watch Igor work so hard to try and keep the scam going at all costs. Well, he has no clue how an investigation is done. He has claimed that the investigators have cleared OC from any wrong doing and released their findings to OC prior to providing the information to the prosecutor. Now the prosecutor is determining if they announce OC has committed no crimes or keep digging. Sure they did Igor. If you truly believe this then you are not as smart as I have given you credit for. This is utter BS. But you have to keep up the appearances that all is well with the multi-nation criminal investigation. What an arse to tell the OC members this total fabrication and lie. European Central Bank refuses Bulgaria to join the euro. One of the reasons: The rampant corruption in Bulgaria. Knowing what we do about Bulgaria, I wouldn’t be surprised if that was actually a real story. They dig their mafia buddies out of a hole, and wipe off the national debt at a stroke. What’s not to like? Let’s see if Igor tells the OC people still left in Bulgaria to immediately contact the Bulgarian Government and tell them they need to make OC the national currency when they go public in October of this year. LOL! One thing for sure is if this multi-national criminal investigation is not concluded before Oc5 8, there will be no public coin offering on any legal exchange. I don’t doubt they will try to launch on some rinky-dink little known trading platform out of SE Asia just to say they went public. OMG!! TOP NEWS COMING SOON!!!!!! DR ZAFAR LEAVING ONELIFE!! MANY MEMBERS KNOW ALREADY. MUHHAMAD ZAFAR IS QUIETLY LEAVING ONELIFE!! CHECK HIS FB PROFILE!! TOTALY CHANGED! What kind of a doctor is this “dr zafar” dude anyways? I asked him this question and where I find and read his dissertation on several occasions. Of course he wouldnt bother to answer me. I wouldnt be surprised if he simply did buy his doctor title (if he even has one at all) from one of those non-accredited diploma mills. Anybody got some information on this?! I always get a kick out of the big guns leaving OC “quietly.” As soon as it is known publicly they left it is no longer quietly. Now the still remaining faithful should be asking, which they won’t, why when the ICO is so close and OC could take away all his coins, err tokens, err whatever they are calling them now. But this is not a Ponzi. As the fastest growing company in world history, and the world’s largest digital currency, OneCoin has emerged as a threat to the global establishment, which includes sovereign world governments, central banks and digital currency exchange monopoly cartels. This makes OneCoin and its founder a huge target for attack, hatred and fake news. Dr. Ruja Ignatova, 37 year old OneCoin founder and CEO, has received several death threats, and therefore has not been seen in public for several months. And let’s see now all faithful Pakistani ..Indian and Muslim community members :)) how smart their leader is haha. This video is no longer available because the YouTube account associated with this video has been canceled. The end result is same – account has been removed. Not the video but the account. Can’t remember if I’ve said it but Murdoch sounds a lot like Ed Ludbrook 2.0. Ah well, what’s another “professional” reputation ruined. Always fun to watch the inevitable meltdown denial. I’m sure someone will explain that Zafar’s deleted Youtube channel was all a result of badmouthing and evil propaganda from OneCoin-haters. OTOH, it is all a benefit for him if he now decides to jump off the sinking ship – less evidence for his victims. “It’s not just a visual bug, because you can’t buy any coupons from DealShaker if all your coins were in CoinSafe and this happened. Not being able to buy coupons is a true problem, not some visual glitch. This is one situation when it would be nice to be able to see yourself that your coins are in the blockchain. But it’s not possible. Victims are getting closer and closer to the painful truth. October is getting near and no meaningful progress on any front. Only bad news mounting. Recruiting essentially dead — Third World is the only place where the scam can lure in some people. No Ruja or any other official leader taking charge. In Australia there are DIAMond leaders who don’t have clue what BTC is lol!! It’s just not in Australia, but in almost every country they are in. So much for the value of “all their educational material” they tout you were buying not OneCoins.